My last post, Comparing 1959 & 1960 Topps All-Star Rookie Teams, implied something important about how Topps approached innovation. When rookie subsets first appeared in 1959, they didn't happen by accident. Baseball events, customer insight, and a desire to outsell competitors led Topps down that road. 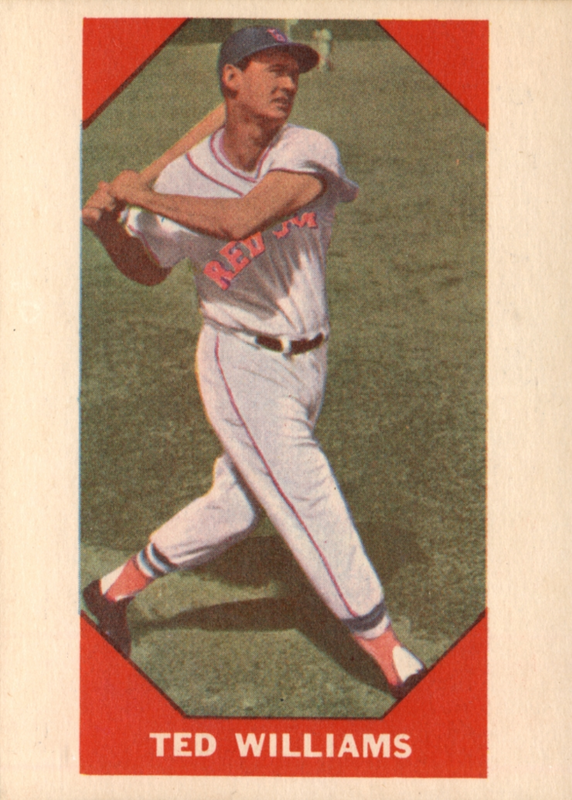 Rookies also weren't the first dedicated subset, as that honor belongs to 1958's All-Stars. To better understand rookies and their special billing, let's investigate that 1958 All-Star team. First of all, since MLB's All-Star Game started in 1933 and proved popular from the get-go, why no All-Star sets before 1958? One factor in leaving out All-Star rosters was the time required to create and distribute cards. Topps knew baseball sales would dry up by September, so normal candy store economics didn't support designing cards for July's All-Stars if they'd be ready in October. They'd need a good reason to create something so comparatively late in the year. As you'll see later, Topps added this subset after Opening Day, but before the All-Star game itself. Seasonal sales matter because baseball itself jockeyed for calendar space at Topps, who printed sets for various sports, military themes, and "whatever pop culture kids found interesting." In 1956, kids found 21 year-old rockabilly sensation Elvis Presley very interesting, and so Topps went to work. In late 1956, Topps published this Elvis set under their Bubbles, Inc. brand and used a near-photo quality color process that proved so popular, they repurposed it for 1957 baseball. Their 1956 baseball set had used hand-painted photos on big stock (3-3/4" by 2-5/8"), but Topps didn't stick with it for the sake of tradition. 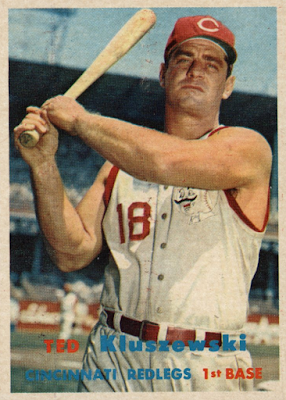 The Elvis card size (2-1/2" x 3-1/2") and focus on color photography became sports industry standards. While All-Star Games drew a lot of fan interest, another factor in leaving them off cardboard was the ongoing struggle between Bowman and Topps over player contracts. It'd be risky to plan and print All-Star rosters, only to learn you'd lost players to a competitor. 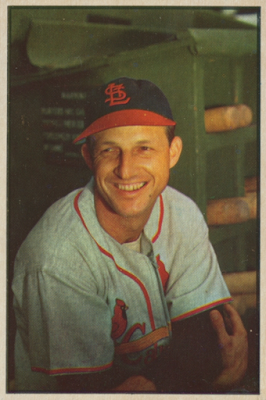 Stan Musial, for example, never signed for Topps prior to 1958. All-Star sets missing major names would be unsatisfying for collectors. Bowman's bankruptcy in early 1956 (and sale of all player contracts to Topps) removed one competitive obstacle, but I think the public kerfuffle over 1957's All-Star Game proved just as important to the genesis of 1958's cardboard All-Star team. The Reds weren't Topps only headache. They still wanted The Man. Bowman didn't hold an active Musial contract at bankruptcy, so Topps didn't acquire one. 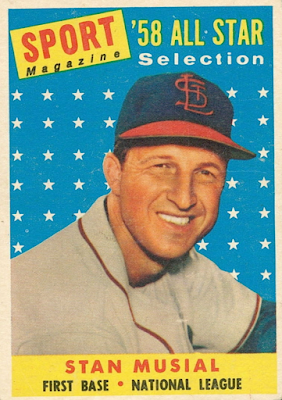 Prior to 1958, Stan Musial refused to sign a Topps card contract, citing "insufficient compensation." 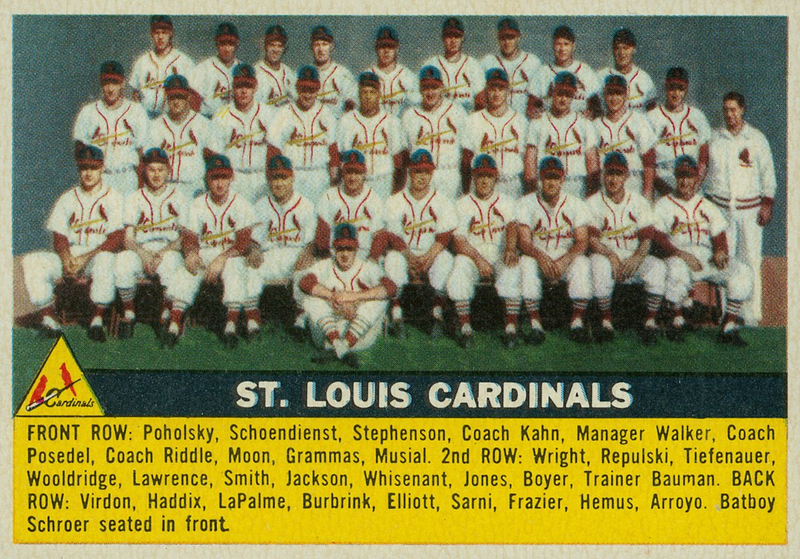 Topps could only show a tiny Musial on Cardinals team photos, something they keenly wanted to change. 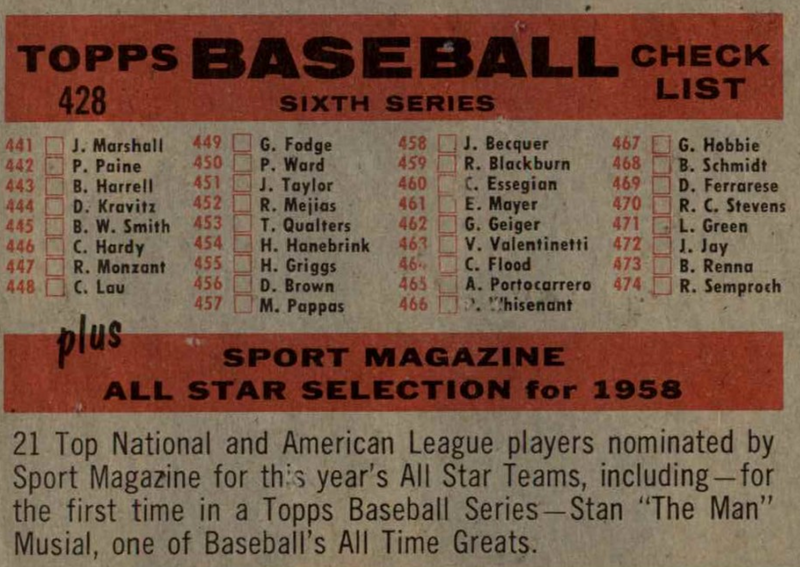 When Stan Musial finally did sign a contract partway through 1958--here's one account about why and how--Topps promptly added the #475-495 All-Stars as an end-cap to their set under the SPORT Magazine header, almost certainly to accommodate Musial. 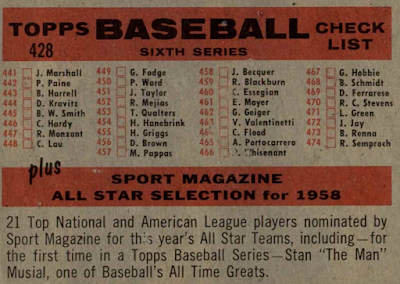 This 1958 Topps final series included a total of twenty-one "SPORT Magazine '58 All Star Selections"--two ten-man AL/NL lineups and one card for both managers. Packs reached candy stores in July and August. 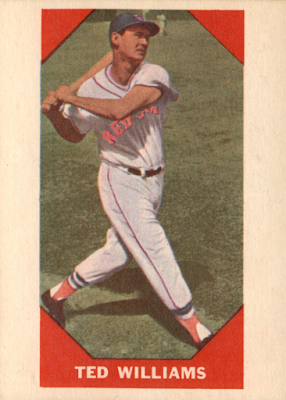 Topps even proclaimed Stan's debut during series five, #371-440, as a footer to their last "regular" checklist on the back of Cincinnati's team card. They note players are "nominated by Sport Magazine for this year's All Star Teams," which defrays the obligation to get correct lineups. 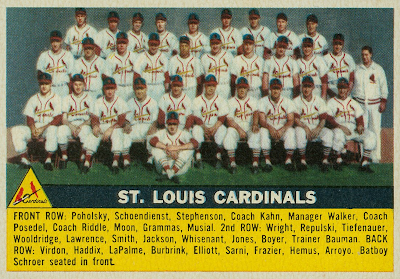 This sixth (and last) Topps series was just 55 cards, #441-495. So how did Topps work these stars into that final series? 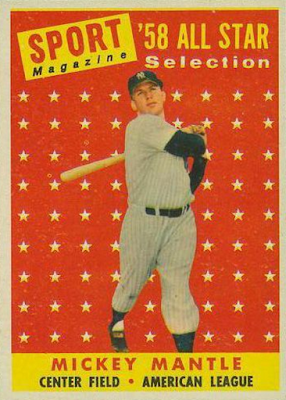 PSA on 1958's All-Star subset: "Many believe that the Stan Musial and Mickey Mantle All-Star cards were triple printed and replaced cards #443 Billy Harrell, #446 Carroll Hardy, #450 Preston Ward, and #462 Gary Geiger on the printing sheets, making those four cards short print cards." Mickey's extra-printed card features a 1956 spring training photo from Florida. Bulwarking PSA's theory about triple- and short-printing, this partial sheet shows 3 Musial All-Stars above what's almost certainly the top border of 3 Mantle All-Stars below. As of writing, the sheet's on eBay for $221. 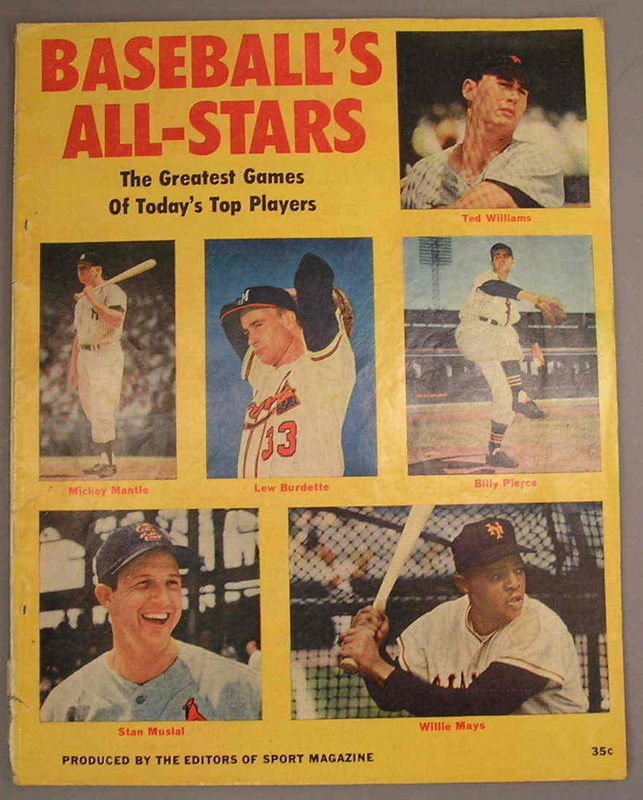 Like The Sporting News and other baseball periodicals, SPORT Magazine editors chose their own All-Star roster independent of the game itself. Being a SPORT Magazine '58 All Star Selection didn't mean you played on Memorial Field that July 8 (box score), it meant their editors thought you were good. Using SPORT's lineup cut time needed for player selection and photo choice, but I do wonder: who paid whom for this privilege? Topps might've compensated SPORT for their editorial work or SPORT could've paid Topps for the on-card advertising. I bet it was SPORT who wrote a check, since they played second fiddle to The Sporting News for readership, whereas Topps was top dog in baseball cards. 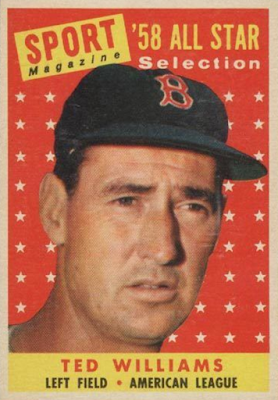 I've one more All-Star theory to throw past you: Ted Williams. 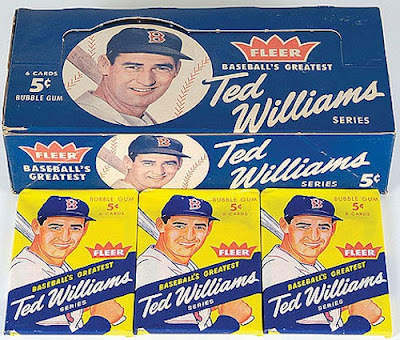 The Kid made his final Topps appearance as an active player on 1958 #485, missing both 1959 and 1960 Topps sets thanks to an exclusive (and exorbitant) contract with aspiring baseball competitor Fleer, who produced a one-man set of 80 cards as 1959 Fleer Ted Williams. Fleer's deal, $5000 annually for four years, essentially bought out Ted's remaining career and Topps might well have known about their negotiations or even bid for Ted's contract at some point. 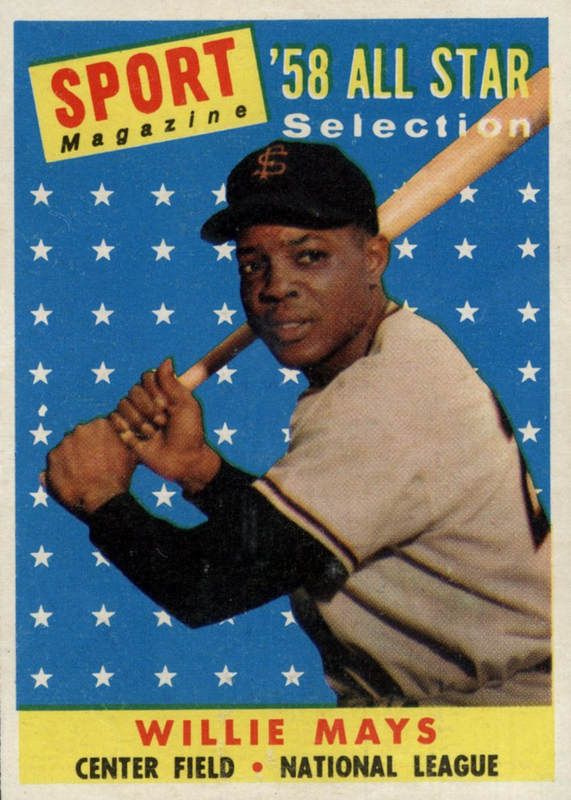 If so, Topps saved a pile of money and squeezed out one more Williams card by creating this 1958 All-Star subset. Let me know if you have other theories or info on how the All-Star set came to be. To me, it's clearly linked to Frick's 1958 removal of fan voting on All-Star rosters, the end of Musial's "Topps holdout," and the ever-present Topps desire to earn money. 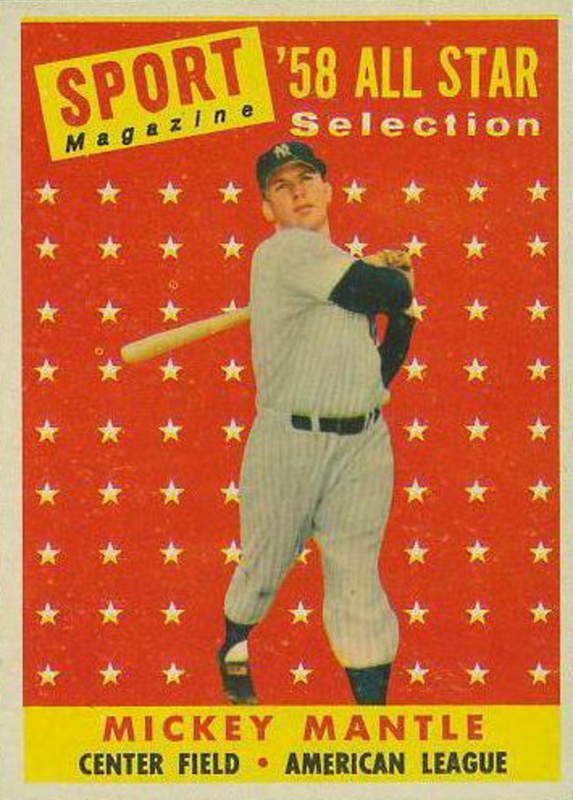 Whatever the circumstances, adding SPORT Magazine's '58 All Star Selections inspired a standard feature of baseball sets for decades to come. Next time, I'll circle back to the topic of rookies and look at how advertising partnerships and further competition from Fleer and Leaf fed the creation of Topps All-Star Rookie teams. Solid Research great article. Thanks. A great article. I love the history side of things like this! Awesome research. I've got to get a wrapper from the fleet Williams set. It would look good with the rest of the set. Shriners this weekend. Nice blog about baseball. I think it help to researcher who research about baseball. Many many thanks for helpful post. Wonderful, insightful backsground on classic Topps cards. Thanks! Thanks for this review. What i found interesting about you is that you mention and look at things that other "reporters" (no offence intendend) don't.